There’s more than a few misconceptions doing the rounds about whether “petrol floats on top of your diesel tank so just top it up” or some other variation. This advice is often dished out by keyboard warrior type armchair mechanic who is quite unfamiliar with the manifestations of fluid dynamics and hydrocarbon refinement. So how did this idiotic idea come about? Petrol has a specific gravity of 730g per litre, that is to say a cubic 10 centimetre container (litre) of petrol will weigh 730 grams. Diesel has a specific gravity of 840 grams per cubic litre. However, as anyone who has poured milk into a stirred coffee cup knows, some things just mix. So what happens?, well the fuel you pump in from the ground is kept quite cool in underground tanks, about 8 celsius is the norm, how do I know? = I tested it, dont ask why. The fuel in your tank after a half hour journey will be about 30 Celsius, quite warm infact, the reason for this is 80% of the fuel pumped into the engine is in fact not used but sent back to the fuel tank, it brings with it the heat from the engine, car fuel systems are set up so that the fuel is pumped from the tank at the MAXIMUM rate that the car can consume it, so that in the event you drop your foot right down you dont have to wait for fuel pump to increase its flow and pressure before you start accelerating, thus the fuel in your tank is warm. So you pour in petrol, which is cold into a warm tank of diesel, since it is pumped in rapidly it stirs in the tank, the petrol should float in theory, but since it is cold it and it is going into a warm bath of diesel it will mix rapidly, this is before the car has even moved, furthermore the petrol will not float, or be more condensed on the top it will bind with the diesel. If anyone thinks that over time they will separate, it simply does not happen, I know this because I have a fuel testing kit, or more specifically a set of hydrometers that cover the ranges of petrol and diesel, I also have large storage tanks for holding mixed fuel, the test I did was to leave 900 litres of mixed fuel in a container for a week, and then take a sample from the top of the tank, and then using a hose from the bottom of the tank, I tested both samples, and they both came out exactly the same. 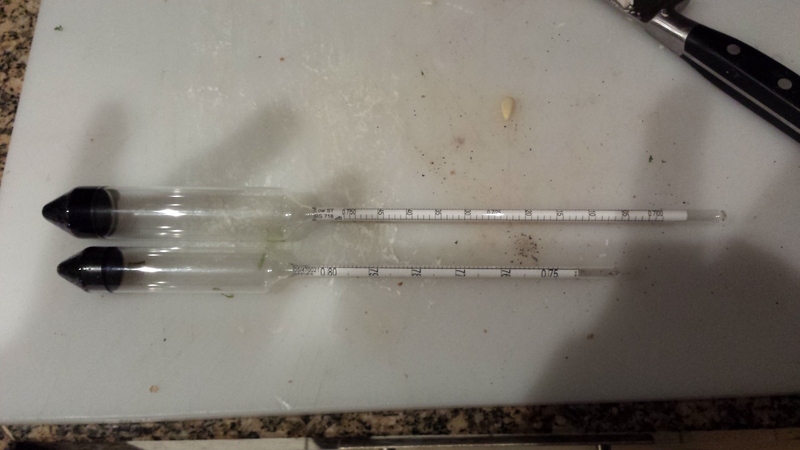 Hydrometers are mostly used in the brewing and distillation industries, I get mine from a company in Edinburgh called Stevenson Reeves . I use them occasionally to test fuel and of course keep them in the kitchen much to the annoyance of my other half. Just a quick note, on the use of hydrometers, without an accurate digital thermometer they are useless, the fluid you are measuring must be at the exact temperature indicated on the hydrometer or the reading will be way off, this is usually 15 or 20 Celsius, even a tiny variation on this will give an inaccurate reading. So to answer your question, in theory petrol could float on top of diesel, but the in reality it mixes completely. There is a way to separate petrol and diesel, it’s called fuel refining.